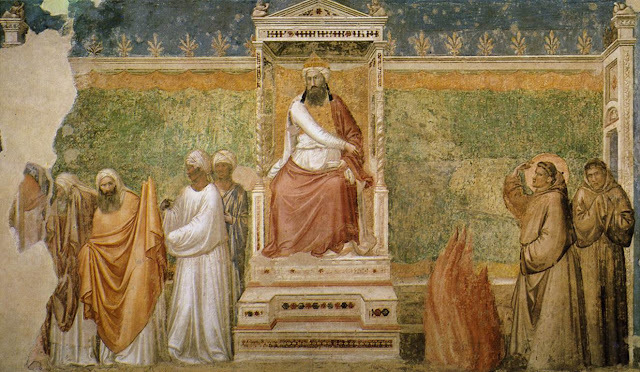 A well known story concerning St Francis of Assisi recounts the time the poverello went to meet the Sultan to convert him (through forthright "dialogue") to the Holy Faith of Christ. It became the stuff of legend, the greatest miracle being that St Francis, having survived the challenge of fire he presented to the Sultan, escaped with his life. By all accounts, St Francis and the companions who he took with him were ready, eager even, to die a martyrs death for Jesus Christ, their love for Him knowing no human limitations. They had already embraced humiliation and poverty, scorn and contempt of the world for the love of Christ crucified and were ready to hand over their lives knowing they would exchange mortal flesh for incorruptibility and glory. To be certain, among Christians, Francis and his companions were then as rare as Saints always are rare, yes even within the Church. But to the Muslims of his time, St Francis had something to say. And they were very impressed because he was not only holy but told them the truth without fear, with no hint of terror. Quite what St Francis would feel about the current state of affairs in the Church I shudder to think. Quite what he would have to say about me, I also shudder to think. What he makes of the the nature of the 'dialogue' between Islam and the Church, I shudder to think. Just like the Church's 'dialogue' with Judaism or with any other religion, the nature of the dialogue currently proposed by the Church takes the form of a photo-opportunity and a handshake. The Manchester bombing marks a defining moment in the life of the United Kingdom. At the moment, things are understandably raw. How could it be anything but? Rhetorical slogans are being thrown across internet forums and on social media that suggest that we in some way stand 'united' and that we will not be daunted by terror. They range from any sentiment of anger and defiance to stubborn English grit, to an appeal for unity in the midst of hatred and violence, yet natural as these responses are, they show us no vision of hope for the future of our land and offer to the Muslim community no response that can challenge them. We want change, but we are happy for things to remain the same because change is also daunting. The Catholic Church - and only the Catholic Church - remains in a supreme position to bring aid to the people of Great Britain. In fact, she is the only force, the only body, that can bring both solace and hope to our people, but if she is to do so, hard truths have to be once again proclaimed. Our leaders once again must find within themselves or rather from God, the courage to speak to our people - including Muslim people, about the saving love of Jesus Christ, the only Saviour of the World. Our country is heading into an abyss, a never-ending spiral of violence and pacification, appeasement and death. Nobody of God would condone the torching of mosques or retribution towards the Muslim community from which sprung the terror that was visited upon Manchester. Equally, however, pious platitudes and secular slogans of 'We stand united!' too ring hollow in the wake of this tragic attack on human life, when little to nothing unites the people of Great Britain but an understandable aversion to terrorist atrocity. However, the Church in the United Kingdom needs to enter into a genuine dialogue with Islam which challenges Islam's most fundamental tenets and in which these tenets are questioned. In fact, Islam's most fundamental tenets need not only to be questioned, but refuted, for we Christians know that teachings that underpin the credibility of the Islamic religion are false. The refutation of the claims of Islam should be announced to Muslims not in order to provoke Islamic anger but because the Catholic religion is the true religion and the Islamic religion contains error, errors which have led many to join the ranks of Islamic militia and spill blood for their cause. The Church, while respecting Muslims and their faith in the God they profess, can never concede, for example, that the Angel Gabriel, having announced to the ever-Virgin Mary that she was to be the Mother of the Incarnate God, appeared to Mohammed centuries later wishing that he would start a new religion to rival that of Christ. The errors of Islam and the errors of the Prophet Mohammed must be confronted. These errors are Christological in nature. Such was the nature of the dialogue which St Francis held with the Sultan, the truth of which could have cost him his life at the time. Many more Saints, Martyrs have given up their lives for just this truth. In fact, Christians around the world are dying regularly for this truth. Why should the Church in the West live comfortably by refusing to offer to Muslims this truth? There can only be one reason and that is that the Church is afraid to speak it. We need to tell Muslims, who profess to believe in God, that in the appearance of the Lord Jesus Christ, the Word was made flesh. God became Man. This God-Man, Jesus Christ performed Miracles because of his divine nature, the Son of the Everlasting Father of Heaven and Earth. There were witnesses to this and to His glorious Resurrection from the dead. In His human nature, He suffered and permitted Himself to be crucified at the hands of the wicked and to die in order to save us from our sins. Jesus Christ is in Heaven not as a mere prophet but as the only Son of God, co-equal with God the Father, God from God, light from light. 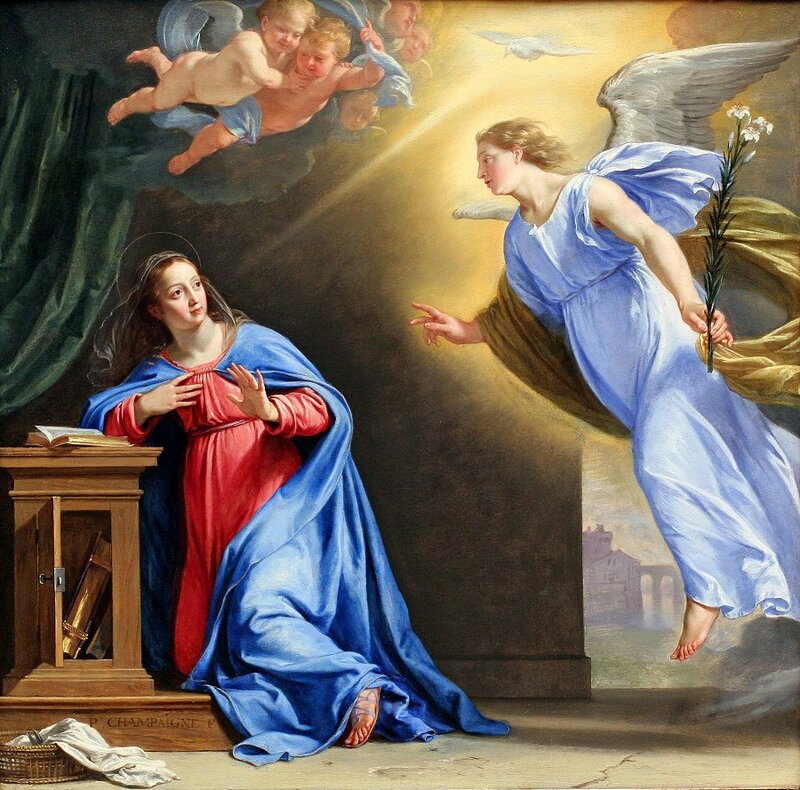 Having ascended into Heaven, Jesus Christ sent to His Church the Holy Spirit to embolden her to teach mankind to be baptised and to follow all the Commandments Christ laid upon His disciples. In order for Muslims to inherit that which God desires to give them which they themselves claim shall be theirs, they do not have to perform attacks upon those who they believe insult the majesty of God. In order for Muslims to inherit the Kingdom of Heaven they must become disciples of Jesus Christ and fulfill all the commandments that He, the Son of God, enjoins on His followers. We must find within the Heart of God, the zeal to announce to Muslims in both charity and truth that while there is much that is good within their religion the very foundations of their religion can never be deemed to be true and their proclamation is indeed an insult to the sublime and ineffable first coming of the Lord Jesus Christ, at whose Second Coming, all shall be judged according to their deeds, words, acts and even thoughts. The final revelation of God is not the Prophet Mohammed but the Lord Jesus Christ, the Eternal Son of the Father, the Second Person of the Most Holy Trinity. We have it on the authority of the Son of God that Salvation, which all Muslims profess to desire, can only be found in professing belief in Jesus Christ not merely as a prophet but as the Lord God Almighty. If England is to be subjected to terror then let it be announced to the Islamic community which, like any religious community contains men both good and bad alike, that those members of their community (be they a small minority) who wish to visit death upon the citizens of our land visit their evil upon a people who stand unafraid for good reason. Let us not lie and say that we are unafraid when we are afraid. 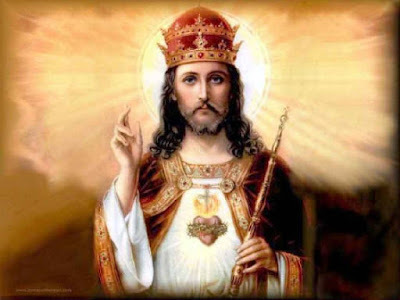 Let us proclaim to the Islamic State who wish to terrorise us, just as Christians do in Syria and Iraq and other countries, that we remain without terror only because Jesus Christ is God, He is the Lord and whatever they wish to do to our bodies, the Crown of Life belongs to those who remain loyal to Jesus Christ until the end. If they who wish us evil do not repent and turn to Jesus Christ they will perish not only at the end of this life but in eternity. It will be the fate they have secured for themselves and their deeds will go with them into eternal fire prepared for the Devil and his fallen angels. Before any Islamic terrorist even considers committing a bombing or a terrorist attack in our land, let the Gospel ring in his ears, may the Church's warning be heard, that Jesus Christ is the Lord, that whatever good their religion contains, their Prophet was a false prophet who brazenly dared to rival the final revelation of the Lord Jesus Christ after His first coming. Mohammed is as useful to the salvation of the Muslims as Joseph Smith is to the Mormons, that is, of no help whatsoever. Mohammed can lead no man to Heaven. Only Jesus Christ can do that since it is He who by His Death and Resurrection has opened Heaven to those who believe in Him. 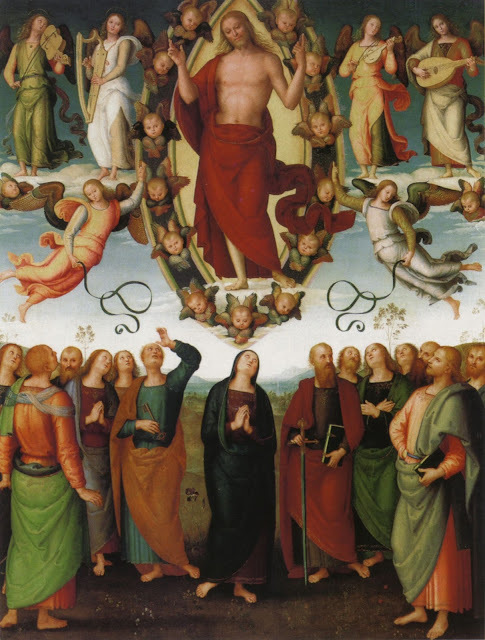 Those who do not join themselves to Jesus Christ in this life and who die without Him excluded from His Holy Catholic Church will not stand at His glorious Second Coming when He judges the world in justice and righteousness on that day when terror will seize all who willfully rejected Him. His verdict will be final. His sentence, eternal. Let every man know this! Let every man prepare himself to battle in this country, not with swords or with fire or with torches, not with bombs or knives or guns or insult for these weapons are the weapons of the enemy. No, let every man prepare himself for death, for if terrorists teach us one thing, it is that we know not the day, nor the hour when we shall have to render an account to the Supreme Judge, Jesus Christ, for our deeds and omissions. Let every man pray for the grace to die, not for the cruel delight of those who with malice take our lives and the lives of our sons and daughters, but for the love of the One who by dying opened Paradise to us. Let every Muslim hear that Mohammed, being only a man, could never by dying bring life to anyone, though he visited death upon many and spread his religion by the sword and captivated many with his teachings as many false prophets have done. Let us treat every Muslims with respect, but let no Muslim be left in any doubt as to the reason for the hope that is within us. No politician offers this country any hope whatsoever. No pop singer does either. It is all theatre. Only Our Lord Jesus Christ can save this poor nation. Only Jesus Christ can offer to our country that hope which never fades, the hope of being forever with Him and His Saints in Heaven. This is the hope which every Islamic terrorist mistakes as his reward for murder, but those who commit murder and die unrepentant will never see God. These senseless men die perceiving that their reward will be Paradise but little do they know that murder merits eternal punishment and murder has no justification. Murderers will not inherit the Kingdom of God! If the Church in this country truly loves Muslims, then we must preach once more the Gospel of Our Lord Jesus Christ undaunted and unafraid. Then, should death come at the hands of the wicked, let us die with the name of Jesus on our lips and forgiveness of our murderers in our hearts. We must prepare ourselves because our Government will not protect us. With every terrorist atrocity, we move closer and closer not to unity, but to the Police State and totally controlled society that is the quest of the hidden hand of Freemasonry within Europe. Those Muslims who are peace-loving will respect us for preaching our religion undiluted to them. Those Muslims who are not peace-loving will react in whatever manner they choose, but we cannot control their choices. This is England. We are free to tell the other religions the truth about Jesus Christ and His Holy Catholic Church. This is not Saudi Arabia. Not yet! We must respect Muslims enough to tell them what we know to be true and give them and ourselves the opportunity to obtain the Salvation for which they and we profess to desire. If they truly desire Salvation, they will accept the Lord Jesus Christ and turn from their Prophet who has led so many of their community so far astray that they are willing to murder children in order to attain the Paradise which eludes them. If they do not desire Salvation, they will follow their false prophet and receive the sentence that the Lord gives them at their death for their decision. We can commend each and every Muslim to the mercy of God, we can pray for all, but we cannot tell a Muslim that Heaven will ever be theirs unless they turn to Jesus Christ and seek the forgiveness of their sins in His name, binding themselves to His One, Holy, Catholic and Apostolic Church. This we must do, in love, for every man, for every man and woman is loved by God and God, loving us all, desires every man and woman to be saved. If we in the United Kingdom cannot tell Muslims that in order for them to attain the Salvation they long for that they must embrace the Faith of Jesus Christ and be baptised, for fear of attack, reprisal, of giving offense, of provoking another terrorist atrocity then indeed, there is no hope for this country. If we cannot proclaim our Faith without fear, then we may as well all acknowledge that we stand united only because we believe that there is safety in numbers. If we are afraid to proclaim the only Faith that saves, then we should acknowledge that terror, despite all our imaginative Twitter slogans, has already won. Pray, pray, pray for the conversion of the Muslims. Pray for the conversion of the United Kingdom. Only in Jesus and Mary will this country ever attain peace! for Manchester and for the world. 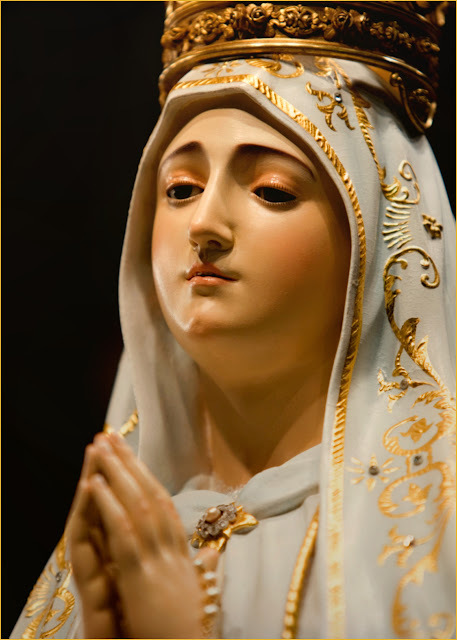 O Sorrowful and Immaculate Heart of Mary, Mother of Mercy, look with pity on the Muslims. Mother of God made man, obtain for them knowledge of our holy religion, and the grace to embrace and practice it faithfully, that through your powerful intercession we all may be united in the same faith, the same hope, and the same love of your divine Son, our Lord Jesus Christ, who was crucified and died for the salvation of all men and who, gloriously risen, reigns in the unity of the Father and the Holy Spirit, world without end. Amen. A brave and inspiring post, thank you. This is a very poignant post. Thank you Laurence. I would like to know what Cat Stevens says about this despicable, cruel, insane attack to the youth, our future. Laurence.Once again a brilliant piece of writing in these sad times for Holy Mother Church.I am convinced that Rome has lost The Faith and is,mainly,run by Heretics, Communists, and just plain Evil Prelates.We will return to a Faithful Catholic Church but we have to withstand the Filth that is being thrown at us from the top.Our Lady promised that the snakes head will be crushed and sooner the better,Keep writing! "The Second Vatican Council changed the face of the Church: made it ecumenical"
"No, not as such, I mean let's hope that eventually we all come together..."
John.Good post.What infidels we have for ,so called,Catholic Prelates.Murphy-Oconnor tried to stop our good Bishop here in Shropshire-Liverpool Diocese,but he didn't succeed.Thanks be to God.May the Progressives die out like the dodos.